NY: Nan A. Talese Books [a subdivision of Knopf/Doubleday - all of which now belong to Random House - just like all your favourite brands of dessert now belong to Nestle- FW], 2009. 480 pp. Frances Perkins (1880 –1965), suffragist and labor advocate, destroyed many of her letters and papers before she died, with the result that only archivists and historians and a few former students still remember her. Even so, Kirstin Downey, a former Washington Post reporter, has written an entirely credible biography of Perkins based on the public record, on Downey’s productive searches in various neglected archives and private collections of Frances’s letters, and on interviews with her daughter and those of her colleagues and friends who are still living. The Woman Behind the New Deal describes not only Frances’s political career, but also her marriage and her close friendships with reform-minded, socially prominent women, as well as her relationships with suffragists, settlement house reformers, socialists, unionists, combative labor leaders, Tammany Hall toughs, and such major figures as Winston Churchill, Al Smith, Franklin D. Roosevelt, and Harry Truman. The scope of her list was breathtaking. She was proposing a fundamental and radical restructuring of American society, with enactment of historic social welfare and labor laws. To succeed, she would have to overcome opposition from the courts, business, labor unions, conservatives. Perkins asked FDR to approve her legislative agenda: a forty-hour work week, a minimum wage, worker’s compensation, unemployment compensation, a federal law banning child labor, direct federal aid for unemployment relief, Social Security, a revitalized public employment service, and national health insurance. Perkins and her determined political allies achieved it all--except for health insurance. Opposition by the American Medical Association was too strong. Few people rise to high office in Washington, D.C. without thick skins and hard work in the political trenches. It is difficult to imagine the heartless animosity and unjust criticism Perkins experienced as a woman in public life. Her views were so progressive that conservative members of the House of Representatives tried to impeach her in 1939 for failing to enforce US immigration laws, a move by the House that the Supreme Court disallowed. The unhappy congressmen wanted Frances out for refusing to deport suspected Communists and for doing her best to help the thousands in Europe fleeing the Nazis. She was single-handedly responsible for saving the Geneva staff of the International Labor Organization by persuading Canada to admit them when the state department denied them entry to the US. The ILO became the only League of Nations entity to survive the war. Perkins served twelve years as our fourth secretary of labor (1933-1945). She did not engage in self promotion, did not hold press conferences, but was loved and admired by those who knew her well. She never forgot or neglected a friend, high or low, and her dedication to the common good was unflagging. When the political tide was against her, she accepted what progress could be made and tried again the next year. In 1946, she published The Roosevelt I Knew, a biography of FDR. Her close friendship with Franklin was not romantic--it was a meeting of minds and spirits. She was the first person he wanted to see when he started his Washington workday and often the last person he talked with in the evening. One of Frances’s professors at Wharton, impressed by her aptitude, helped her arrange a fellowship at Columbia University. In 1910, she earned a master’s degree in political science and then took a job heading the New York office of the National Consumer’s League. She moved to Greenwich Village, “a center of intellectual ferment.” Sinclair Lewis fell in love with her and regularly proposed marriage until she wed government reformer Paul Caldwell Wilson in 1913. Frances attended church every morning of the week while she was working in Washington. Three or four times a year, she made a silent retreat at a Maryland convent where the mother superior was her spiritual advisor. Frances could see auras, and this was an aid in assessing character and recognizing talent. Downey writes that Perkins worried about the growing secularization of America. It was incomprehensible to Frances to think of excluding religion from public life altogether, for it was her religious motivation--to do what Jesus would want one to do--that drove her and fueled all that she had done. This book is beautifully organized, with helpful chapter titles, footnotes divided and renumbered by chapter, a strong bibliography, a good index, and many interesting black and white photographs, though I would wish for more photos of union leaders and suffragists. Keller, Emily. Frances Perkins: First Woman Cabinet Member. Greensboro: Morgan Reynolds Publishing, 2006. ISBN 978193179891. Martin, George Whitney. Madam Secretary: Frances Perkins. New York: Houghton Mifflin Co., 1976. ISBN 0395242932. Pasachoff, Naomi. 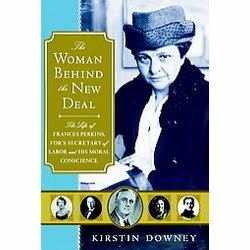 Frances Perkins: Champion of the New Deal. New York: Oxford University Press, 1999. ISBN 0195122224. Perkins, Frances. The Roosevelt I Knew. New York: Penguin Group, 1946. ISBN 0670607371. Severn, Bill. Frances Perkins: A Member of the Cabinet. New York: Hawthorn Books, Inc., 1976. ISBN 080152816X.